Pistachio rose marshmallow treats take your childhood favorite to the next level. Simple and elegant, you’ll love the pistachio and rose flavor combination. So sweet and salty with floral notes from the rose petals. Gluten-free with dairy-free and vegan options. We hit 55 degrees in Chicago this past week. I walked the dog in my shorts and flip flops. Yes, I got a few crazy looks but I just don’t care! I was so happy to have a nice day where it started to feel like Spring! Did I wear my massive winter jacket in the same day? Yes, yes I did. But when we start getting 55 degree days in Chicago in February, needless to say I start craving those Spring flavors. Lemon, rose, anything fruity. I immediately started thinking of pistachio and rose. There’s something dreamy about this flavor combination. These pistachio rose marshmallow treats have been on my mind for a few years now. I’m not sure if I’ve told you how I come up with my recipe ideas or not. This is probably unsurprising to anyone who knows me, but I think about food all day long. I keep a post it note or journal near me and whenever I think of a recipe idea or flavor combination, I write it down. It’s no wonder this list is at least 100 recipe ideas long. But on the top of the list has been lurking this gluten-free pistachio rose marshmallow treat. Now that I’ve created and tested the recipe many times, I don’t know what took me so long to make it! Marshmallow treats, or rice krispies treats – if that’s what you prefer to call them – are such a quick and easy dessert to make. They were entertaining favorites in my house growing up. 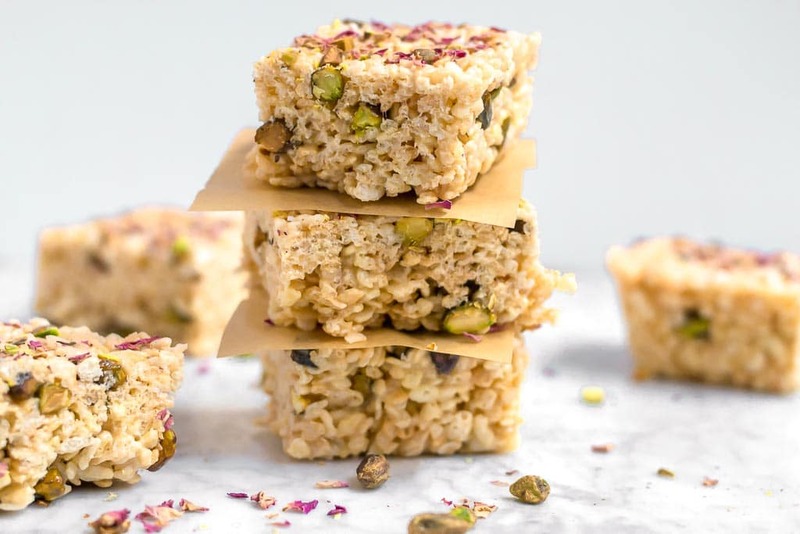 This rose pistachio version takes these marshmallow rice krispies treats to a whole different level! The rose is fragrant, but not overpowering. The pistachios are crunchy and salty. The marshmallows are ooey and gooey. Together they create this sweet and salty combination that is not to be missed! 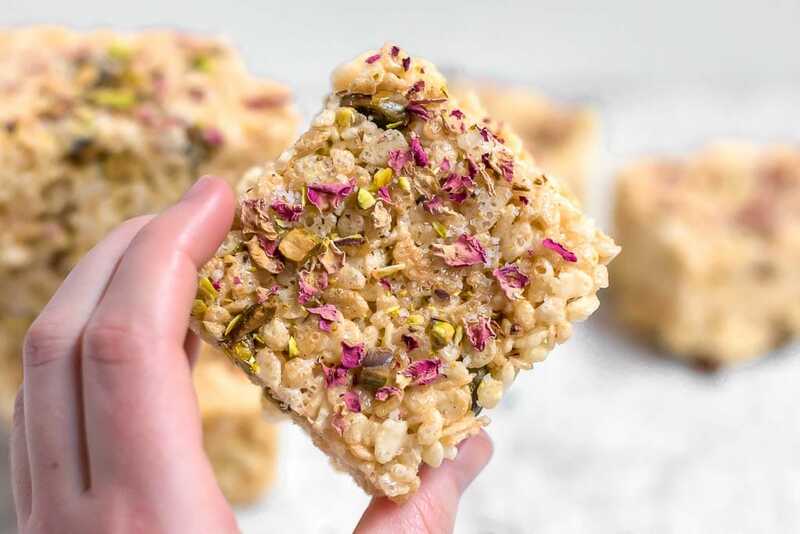 I love making these gluten-free pistachio rose marshmallow treats for all different types of occasions, like Easter, Mother’s Day, and bridal shower. Oh can you imagine how elegant these treats would look cut into 1 inch squares for a bridal shower? Swoon-worthy! I know what you might be thinking – aren’t Rice Krispies gluten-free already? You keep saying gluten-free rice cereal. NO! Rice Krispies contain malt barley and barley is not gluten-free. Find a rice cereal that does not contain malt. Erewhon and Barbara’s brown rice cereal are both gluten-free and are good options. If you know of any others, please leave me a comment so I can check it out and recommend it to other readers! I’ve learned some great tips and tricks along the way that I think would be helpful for you. Grease that pan! If you don’t spray your baking dish with cooking spray, you’re going to have a difficult time of getting these sticky marshmallow treats out of the pan. Definitely don’t forget to spray the pan. That being said, don’t forget to check your cooking spray to make sure it’s gluten-free. They now make a cooking spray that is made for baking and it contains FLOUR! Meaning not gluten-free, friends. Check your labels. Spray the spoon you’re using to stir together the marshmallow mixture and cereal to prevent a stick situation. Clearly most of my tips involve cooking spray for this recipe! Do not cut the marshmallow treats right away. Wait at least 30 minutes to let them cool and solidify and you will have a much easier time cutting them into perfect squares. Store the pistachio rose marshmallow treats at room temperature. You can easily cover the pan with aluminum foil or plastic wrap or you can store the cut marshmallow treats out of the pan in aluminum foil. Placing the treats in the refrigerator will create soggy treats. No one wants soggy pistachio rose marshmallow treats. No one. For an added little bit of fun, you can add food dye to the marshmallow mixture to create pink or green marshmallow treats. This would be super cute for a personalized bridal shower! This gluten-free pistachio rose marshmallow treat is elegant and delicious. The sweet and salty combination will have your taste buds dancing and your belly happy. This recipe is easily made gluten-free and vegan, too. 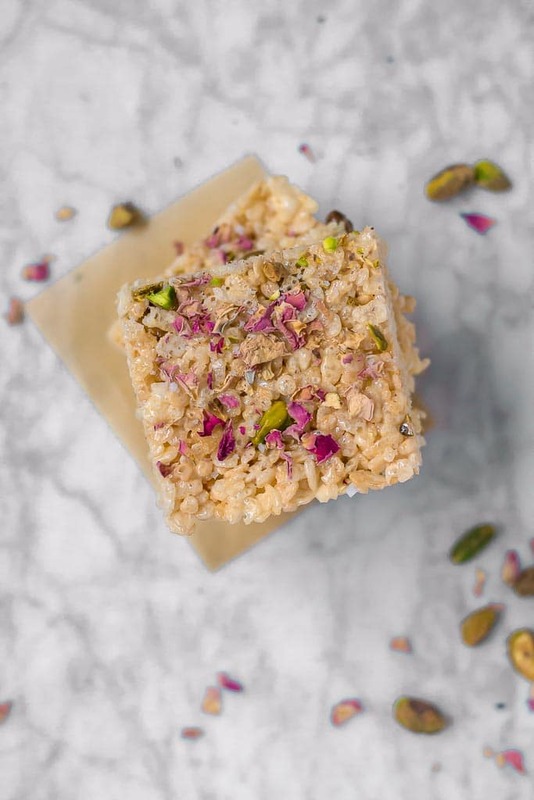 This gluten-free pistachio rose marshmallow treat is elegant and delicious. The sweet and salty combination will have your taste buds dancing and your belly happy. This is easily made gluten-free and vegan as noted in the recipe. In a large pot over medium heat, melt butter, about 2-3 minutes. Stir in mini marshmallows and cook for 2-3 minutes while stirring, until melted. Once the marshmallows are melted, stir in the rose water. Take the marshmallow mixture off the heat. 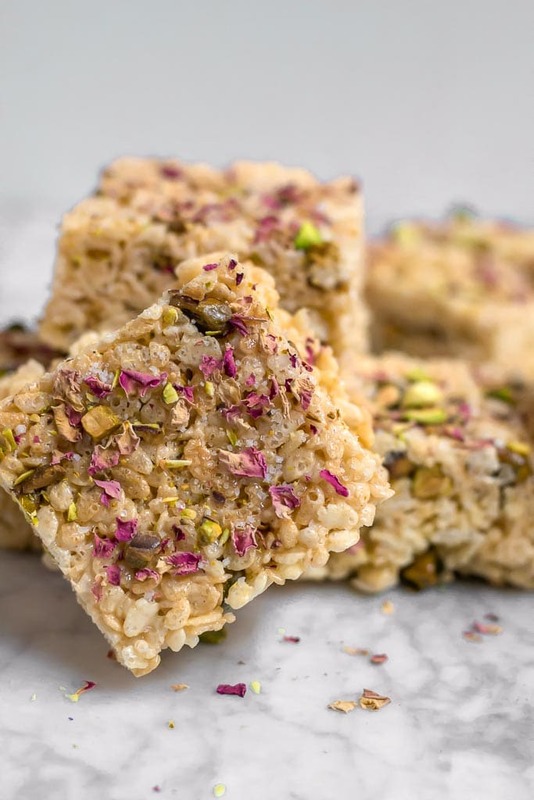 Stir in the gluten-free rice cereal and pistachios. Stir until cereal is completely coated with the marshmallow mixture. Pour into an 8x8 inch or 9x13 inch baking pan that has been sprayed with cooking spray or lined with parchment paper. Spray the back of a spatula or your hands with cooking spray and press into the pan so that it's an even layer. Sprinkle over the top with chopped pistachios, culinary rose petals and fleur de sel or other sea salt. Let set completely. I made this is an 8x8 inch baking dish because I like my marshmallow treats tall, about 2 inches high. You can also make it in a 9x13 inch baking dish which create a shorter, about 1 inch, marshmallow treat. Nutrition is calculated for 12 bars made in the 8x8 baking dish.